The word "anatomy" refers to the names of the parts that make up the body. For the typical hobbyist, the most important anatomical terms to know are the names of the major external features like the various fins and the operculum (gill cover). The body of a cichlid actually contains hundreds of bones, muscles and internal organs, all of which have names. 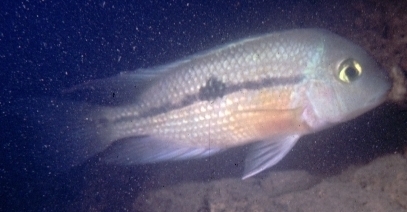 Historically, a researcher had to dissect a cichlid to examine these structures. More recently a technique known as "clearing and staining" allows a scientist to view and study these structures intact. With this technique, bones stain red while cartilage stains blue. Move your mouse over the image below to see the specimen "cleared and stained". Click on the image to see more cleared and stained cichlids. The cleared and stained specimen of Hypsophrys nicaraguense is courtesy of the Texas Memorial Museum, University of Texas. It was cleared and stained by Darren Hulsey of the University of California, Davis.